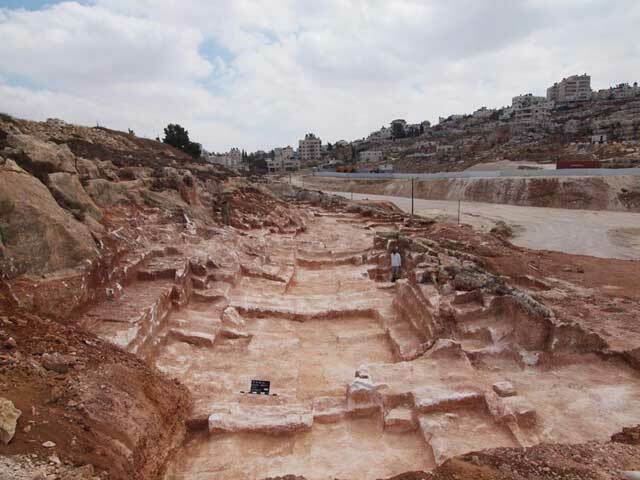 During June–August 2011. a salvage excavation was conducted west of the Beit Hanina quarter in Jerusalem (Permit No. A-6225; map ref. 220986–1017/637439–68), prior to paving Highway 20. 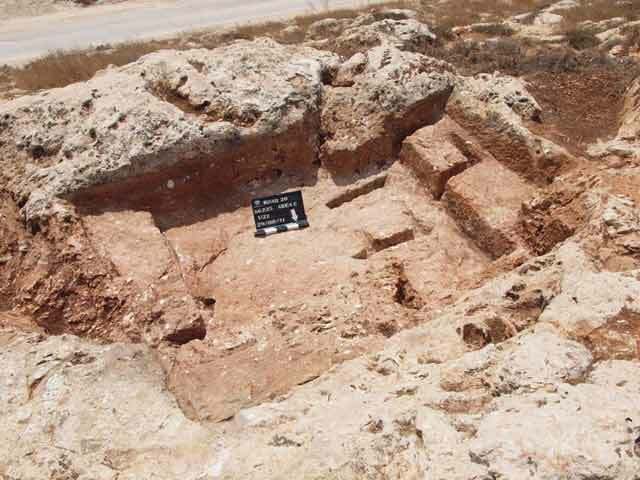 The excavation, undertaken on behalf of the Israel Antiquities Authority and underwritten by the Moriya Company, was directed by I. Zilberbod, with the assistance of N. Nehama (administration), M. Kunin, A. Hajian, B. Antin and M. Kahan (surveying and drafting), A. Peretz (field photography), Sky View Company (aerial photography) and I. Berin (plans). 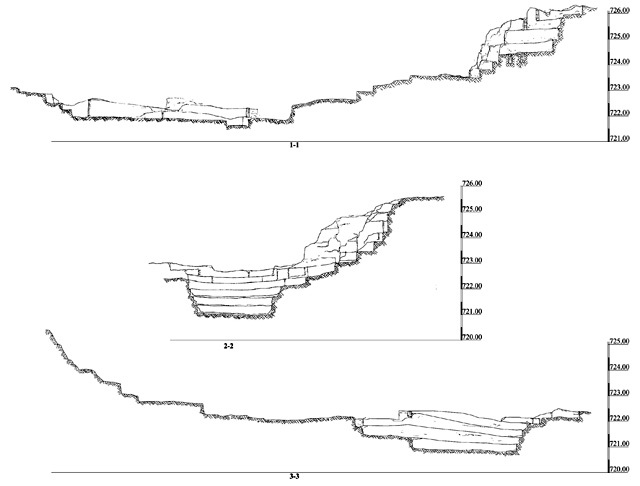 Four excavation areas (A–D; Fig. 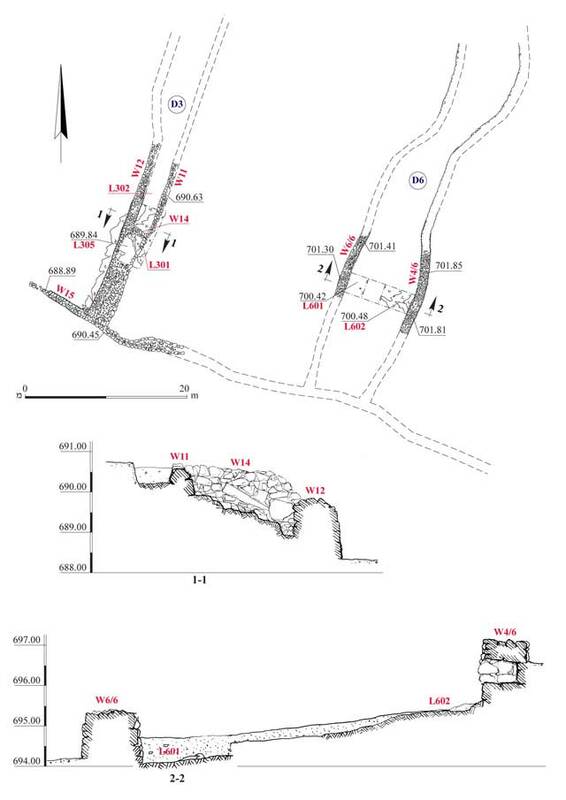 1) were opened and two secondary areas were opened in Areas B and D. Stepped quarries (quarrying depth 2–6 m) that covered a large area were discovered in Areas A, B and C, which extended across the southern slope of a hill, near its peak. 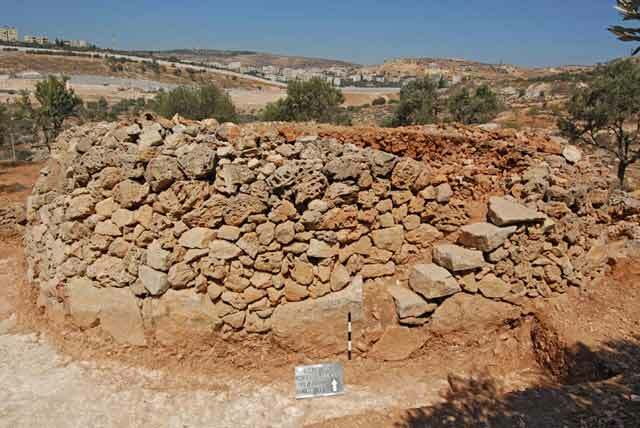 Area D extended southwest of the other three areas, along the northern slope of an adjacent hill; farming terraces, fences, watchman’s huts, stone clearance heaps and a cistern were exposed. Area A. A large quarry (c. 25×25 m; quarrying depth 1.5–3.0 m; Figs. 2–5), which had three–six quarrying steps, was exposed. The quarry was enlarged in several directions and consisted of several units (A1–A7). 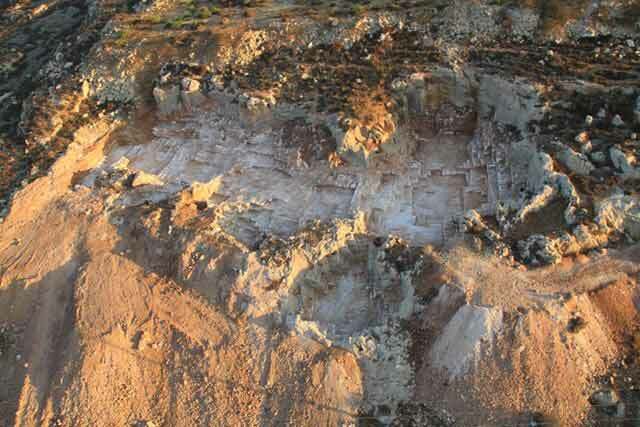 Quarrying steps, mostly on low levels, were discovered in the eastern part of the area (A1). 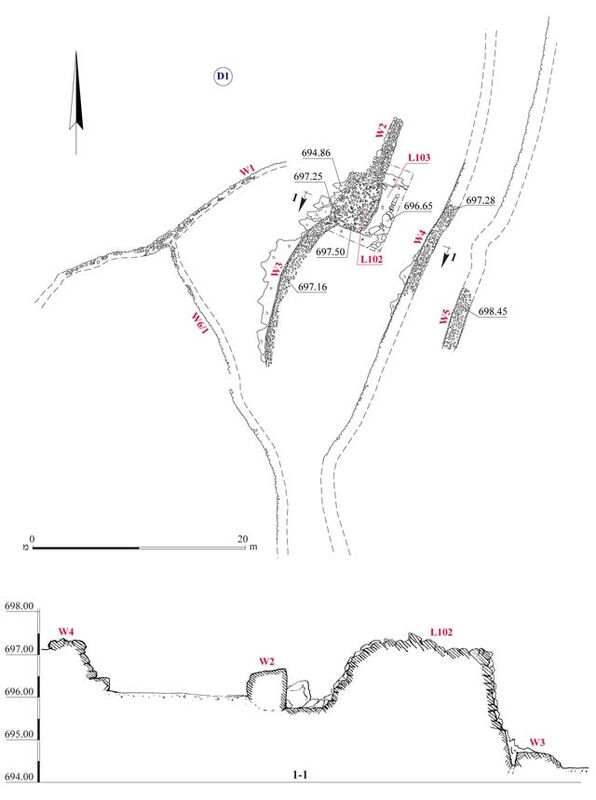 Six quarrying steps on high levels were revealed in the northern part of the area (A2); separating channels (0.10–0.25×0.50 m) between stones were preserved. 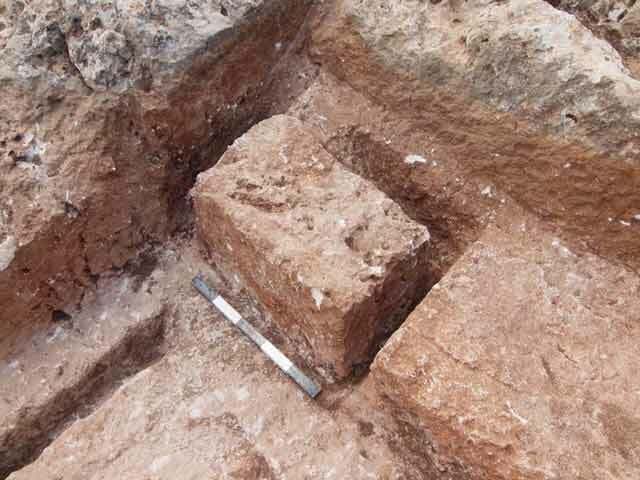 In addition, a large stone bloc divided into three stones (each 0.4×0.4×0.5 m) was exposed in situ;the quarrying of the stones in that bloc was incomplete (Fig. 2, View A). A large stone (1.5×2.0 m) that was not detached from the bedrock was exposed in the center of Unit A3. Quarrying steps were discovered in the northwest of the area (A4). Traces of the rock-cuttings indicate that rows of stones were quarried (dimensions of stones 0.5×0.8 m). A rock-hewn surface (3.5×7.5 m) was exposed in the western part of the area (A5), located c. 1.5 m lower than the adjacent quarrying levels. Five–six quarrying steps were hewn in Unit A5. 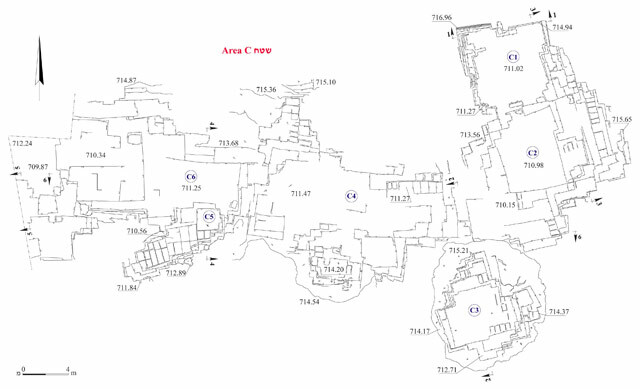 Numerous traces of quarried stones that had been cut and detached were visible in the middle and south of the area (A6, A7); these provide the most common sizes of stones that were hewn in the quarry (0.4×0.5 m, 0.5×1.0 m). Area B. Two small quarries (B1, B2; Figs. 6, 7) were exposed. 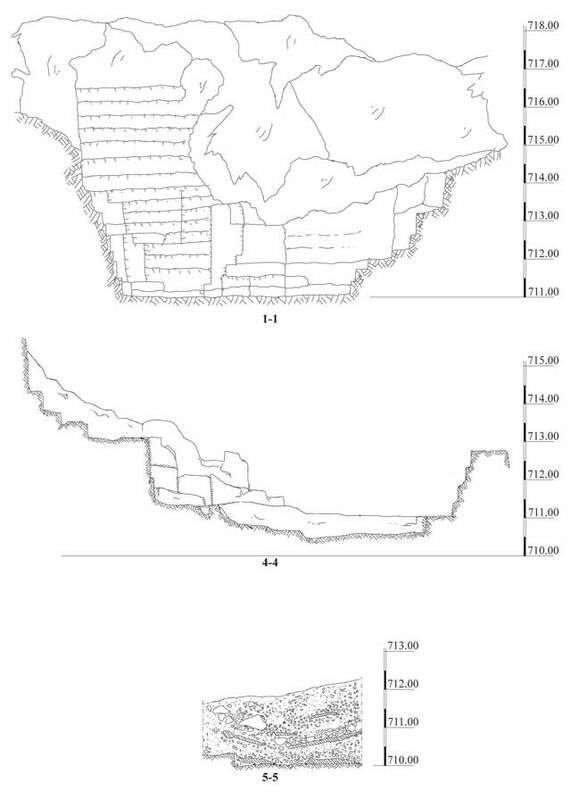 Signs of stone quarrying (size of stones 0.4×0.8 m, 0.5×1.5 m) were visible in Quarry B1 (6.0×6.5 m, quarrying depth 1–3 m; Figs. 8, 9), in the north of the area. The detachment channels (size of stones 0.10–0.20×0.25–0.50×1.50–2.00 m) of stones could be seen along the bottom of the quarry. A round rock-hewn installation (L205; diam. c. 1.5 m, depth c. 2 m), whose use is unclear, was discovered in the northeastern corner of the quarry. Quarry B2 was smaller (2.5×3.5 m; quarrying depth 1.5–2.5 m; Figs. 10, 11) and separating channels of stones were visible on its bottom (length 0.35–0.50 m), indicative of medium-sized stones that were hewn (c. 0.4×0.5 m). Area C. A large quarry (c. 1,000 sq m; Figs. 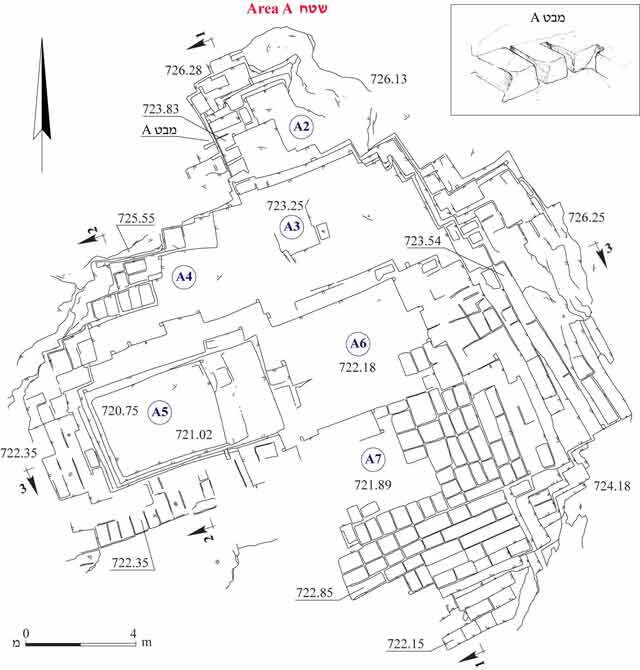 12–17), composed of several units (C1–C6), was exposed. Eleven to fifteen steps, hewn to a depth of 3–6 m, were exposed in Unit C1. The quarrying in Unit C2 reached a depth of 3–4 m. Unit C3 was c. 2 m lower than the rest of the units in the quarry. Three to six steps, hewn to a depth of 0.5–2.0 m, were exposed in this unit, as well as separating channels of stones (depth 0.45 m). The quarrying in Unit C4 was done to a maximum depth of 5 m. Unit C5 extended across a slope, at a level c. 1.5 m below that of the surrounding units. Preserved on the bottom of the unit were the distinct signs of quarrying and detachment of stones, indicating that medium and large stones were cut there (stone dimensions 0.4×0.8 m, 0.5×1.0 m). 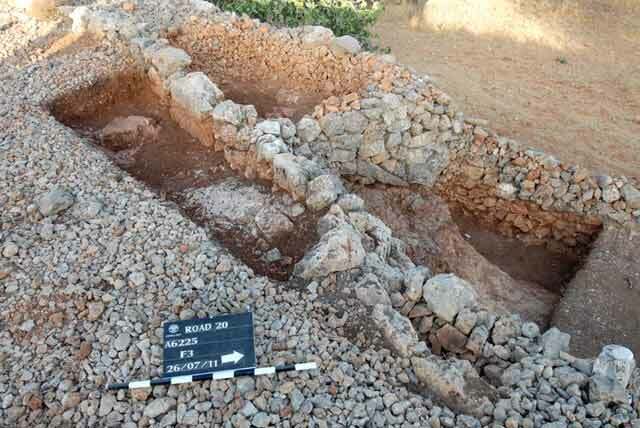 The western part of Unit C6 was located outside the excavation area. 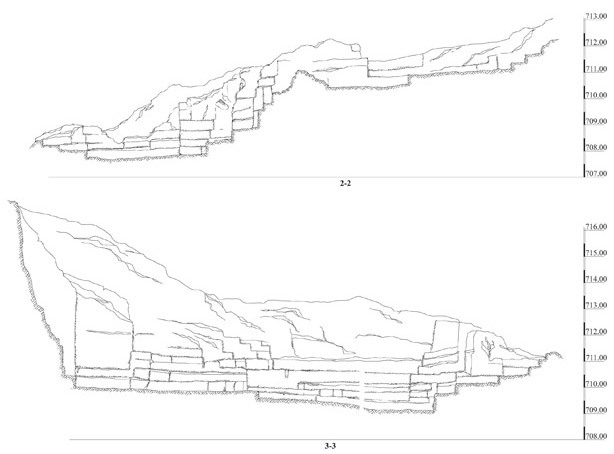 The height of the steps, quarrying marks of the stones and the separating channels in Area C show that the hewn stones were of similar dimensions as those cut in Areas A and B.
Drillings (diam. 2.5 cm, length 1 m) that were discerned in the upper levels in the northern part of the quarry indicate that the quarries were also used in the modern era. 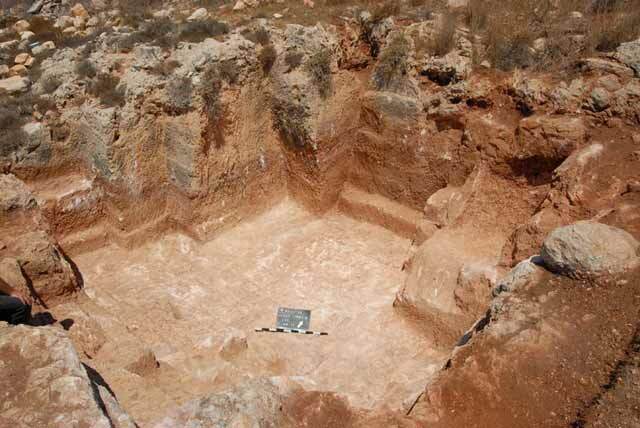 The quarries in Areas A, B and C were covered with dark brown soil containing small and medium fieldstones. Rock-cutting debris was mixed in the soil above the bottom of the quarries. 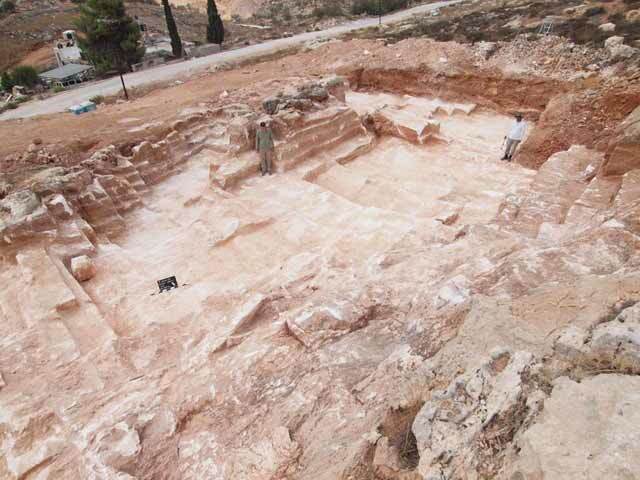 Potsherds dating to the Late Roman and Early Byzantine periods were discovered on the bottom of the quarries and in the overlying soil. 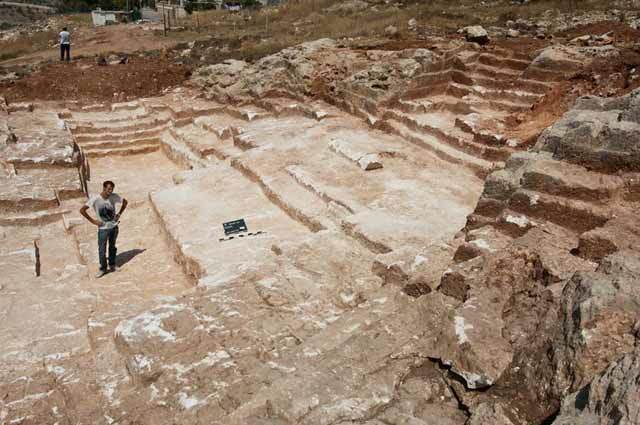 The quarries exposed in the excavation are part of an extensive region of quarries in the north of Jerusalem, which provided the city with building stones in different periods. Area D1 (Fig. 18). 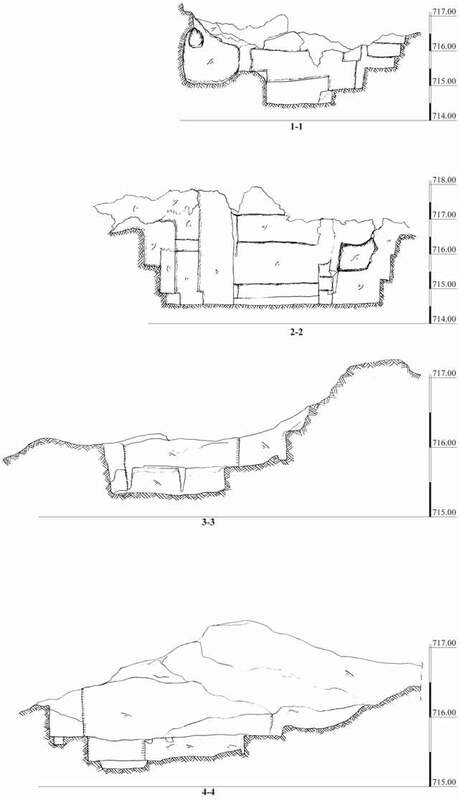 The walls of farming terraces (W1–W6) and a square watchman’s hut (L102; 5.5×6.0 m; Figs. 19, 20) were exposed. Two retaining walls were constructed west and east of the watchman’s hut. 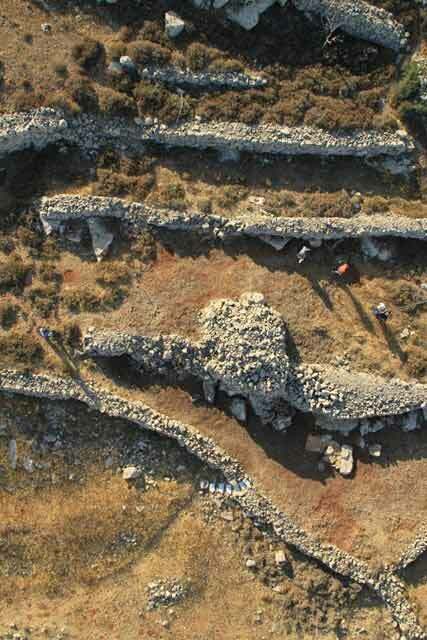 The western retaining wall (preserved height 1.8 m), built of medium and large fieldstones, was founded on the bedrock. The eastern retaining wall (preserved height c. 0.5 m) was built of a single row of large fieldstones. 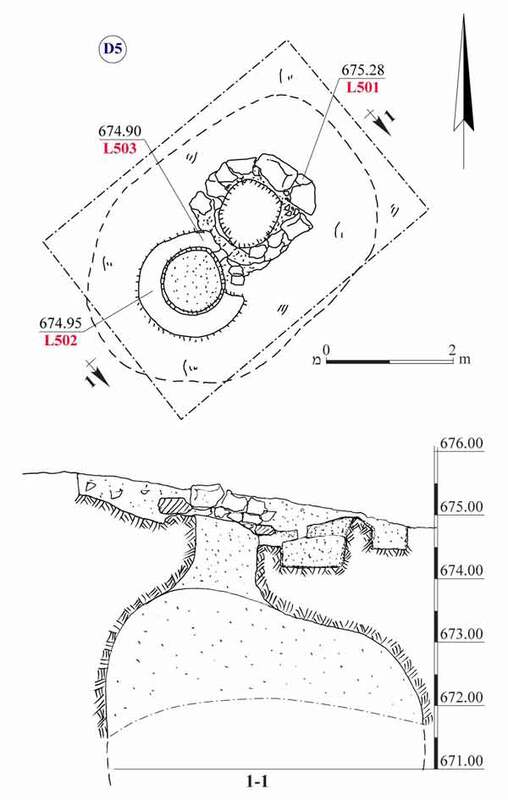 Fill consisting of small and medium stones was exposed inside the watchman’s hut (L103). Several potsherds from Iron Age II and the Late Roman period were discovered in the soil layer on the bedrock around the watchman’s hut. Area D2 (Fig. 21). A circular watchman’s hut (L203; outer diam. 9 m, inner diam. c. 6.5 m; Fig. 22) and three farming terrace walls (W11–W13) were exposed. The wall of the watchman’s hut was built of medium and large fieldstones (W10; width c. 1 m, preserved height 1.5–2.0 m). A staircase composed of stone slabs was built on the eastern side of the watchman’s hut (Fig. 23). 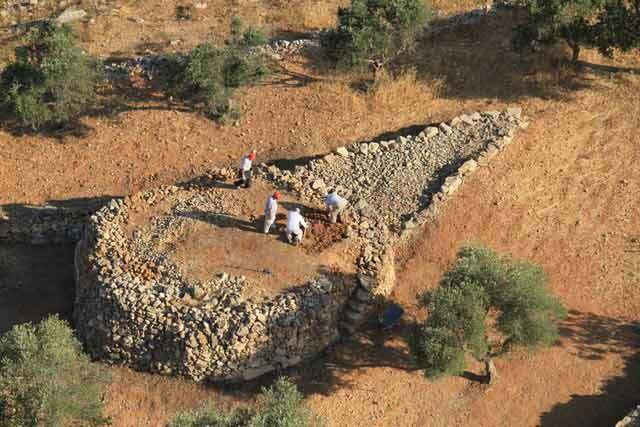 Fill composed of small fieldstones was discovered inside the structure. 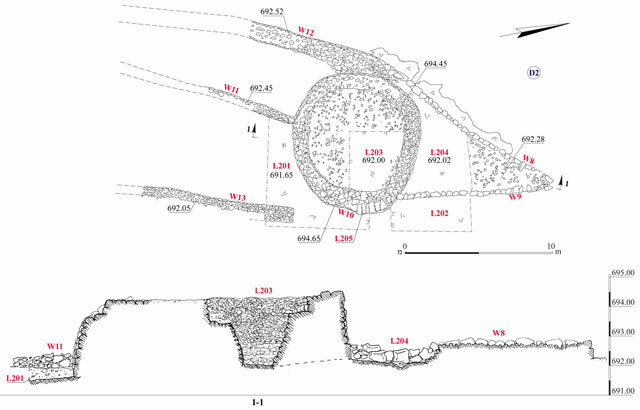 Next to the northern side of the hut was a triangular bedrock surface (L204) on which stone clearance was piled. The surface was delimited on two sides by meager walls built of a single course of fieldstones (W8, W9; width c. 0.4 m). The farming terrace walls were exposed south of the watchman’s hut. Founded on the bedrock, parallel to each other, they were built of two rows of large fieldstones with a core of small stones (length c. 50 m, width 0.6–1.4 m, height c. 1 m). 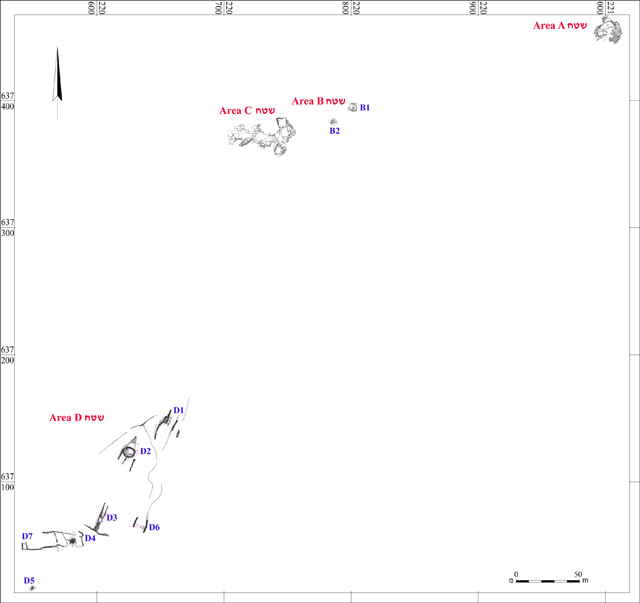 Area D3 (Figs. 24, 25). 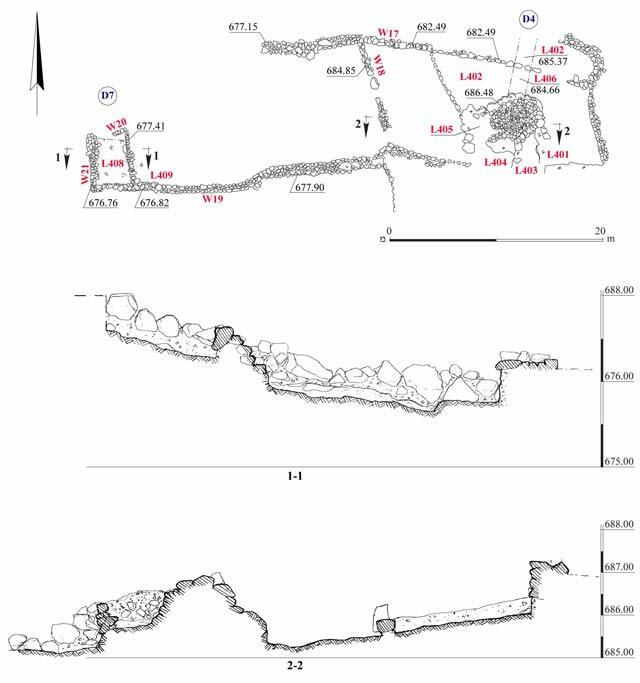 Two farming terrace walls (W11, W12) were exposed and a rectangular area between them that was deliberately filled with small stones, above which was small and medium-size stone clearance (3×13 m, height 1.0–1.5 m). A fragment of a bowl dating to the Late Roman period was discovered below the fill of small stones. Area D4 (Fig. 26). A watchman’s hut (L401; 5.0×5.5 m; Fig. 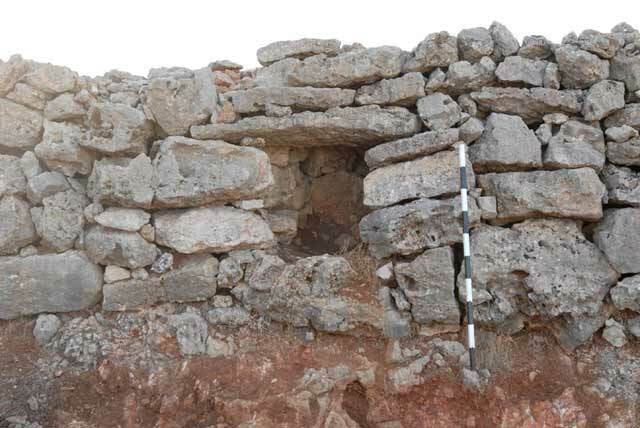 27), farming terrace walls and fences (W17–W19) were exposed. The walls of the watchman’s hut (preserved height 1.0–1.5 m), founded on the bedrock, were built of medium and large fieldstones. 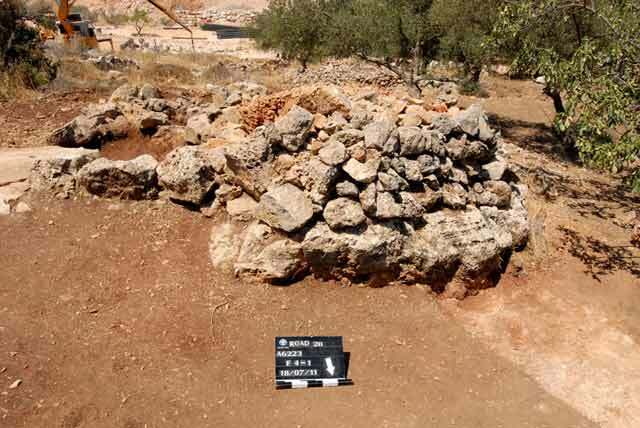 Intentional fill consisting of small and medium fieldstones was discovered inside the watchman’s hut. Area D5 (Figs. 28, 29). 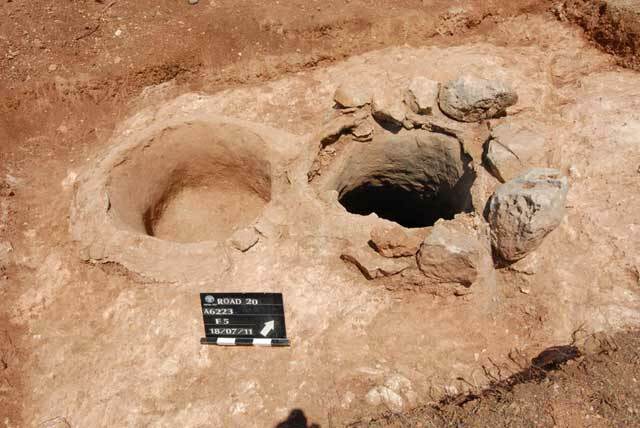 A rock-hewn cistern was exposed. The cistern’s opening and the upper part of its side were lined with cement. The cistern was not excavated, as it was used in the modern era. The opening was circular (L501; diam. c. 1 m, depth 0.5 m). Next to the cistern’s opening was a round installation (L502; diam. c. 1 m, depth 0.5 m) that was probably used as a settling pit before the runoff flowed into the cistern. Area D6 (Figs. 24, 30). 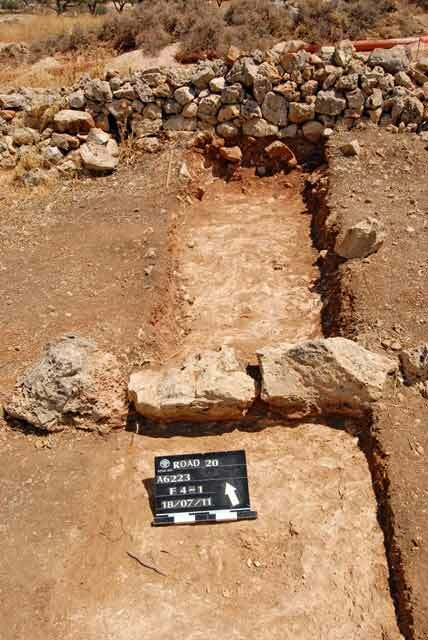 A probe trench (length c. 8.5 m) was excavated between two parallel farming terrace walls. The eastern wall (W4/6; width 1.2 m, height 1.6 m) was built of medium and large fieldstones and preserved seven courses high. A small niche (0.5×0.6×1.0 m; Fig. 31) was built inside the wall. The western farming terrace wall (W6/6; width 1.35 m, height 1.3 m), set on the bedrock, was preserved three–four courses high. Soil fill mixed with a scant amount of potsherds dating to the Late Roman period was excavated between the two walls. Area D7(Figs. 26, 32). Farming terrace walls (W19–W21) were exposed. 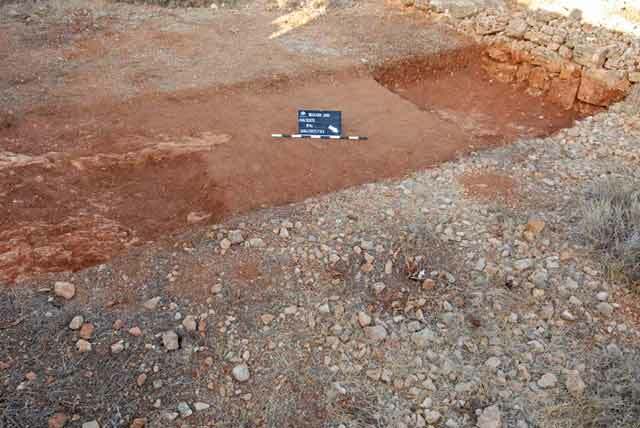 The soil between the walls was mixed with potsherds dating to the Late Roman period. 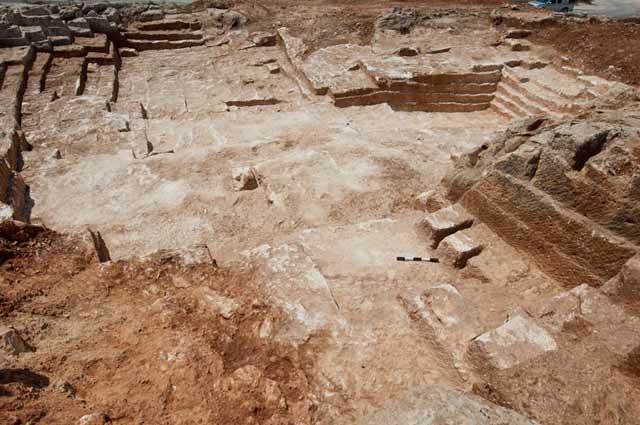 The excavation was conducted in areas that had been part of the agricultural hinterland of a settlement, situated nearby in the Late Roman–Byzantine periods. 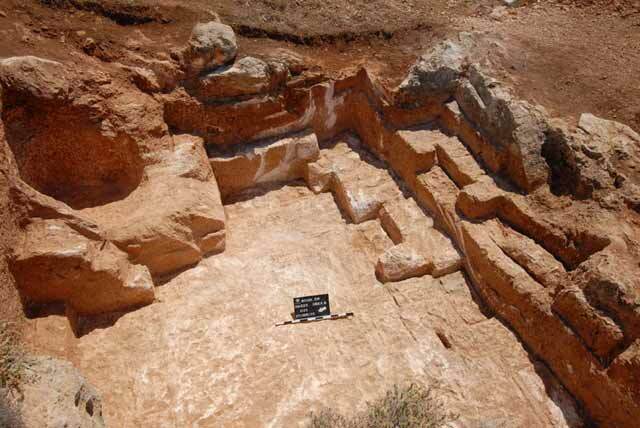 The remains at the site were well preserved thanks to their location in an agricultural region that is still cultivated today. It seems that over the years the farmers utilized the ancient terraces for their needs, and therefore these have remained more or less intact until the present time. 4. Area A, looking northwest. 5. Area A, looking southwest. 8. Quarry B1, looking northwest. 9. Quarry B1, looking east. 10. Quarry B2, looking south. 11. Quarry B2, a hewn and undetached stone, looking southwest. 15. Area C, looking north. 16. Area C, looking east. 17. Area C, looking northwest. 18. Area D1, plan and section. 19. Area D1, farming terraces and a watchman’s hut, looking south. 20. Watchman’s hut, looking west. 21. Area D2, plan and section. 22. Area D2, higher view of watchman’s hut, looking northwest. 23. Area D2, watchman’s hut, looking northwest. 24. 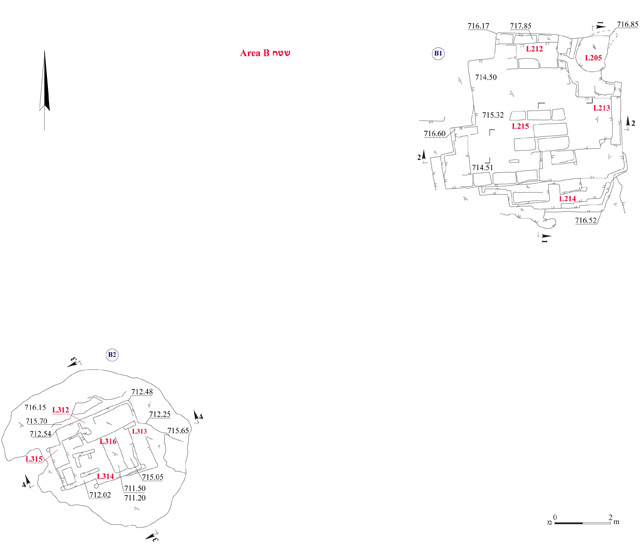 Areas D3 and D6, plan and sections. 25. Area D3, looking southwest. 26. Areas D4 and D7, plan and sections. 27. Area D4, watchman’s hut, looking south. 28. Area D5, plan and section. 29. Area D5, cistern, looking west. 30. Area D6, farming terrace, looking southwest. 31. 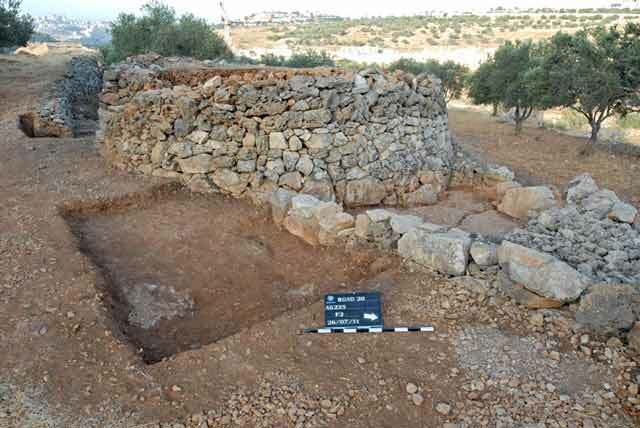 Area D6, a niche in a farming terrace wall, looking east. 32. Area D7, farming terraces, looking northeast.